On Sunday morning [27 September 2009], I was preaching during Morning Prayer and assisting at the Eucharist in Saint Columba’s College, Rathfarnham. By early afternoon, I was in Lucan for the baptism of my newest grand-nephew, Matthew Melinn. Later, we went back to celebrate over lunch in Finnstown House, the country house hotel outside Lucan. Although most of my memories of visiting Finnstown House in my childhood in the late 1950s or early 1960s are vague, I have one distinct memory of running through the fields in the surrounding farm, falling head-first into a bed of nettles and being badly stung. At that time, Finnstown House it was the home of my Great Uncle Con and Great-Aunt Hannah. Cornelius D. Crowley (1879-1972), of Finnstown House, Lucan, Co Dublin, and Roscrea, Co Tipperary, was originally from Millstreet, Co Cork. He was one of my great-uncles, a brother of my grandmother, Maria (Crowley) Murphy (1882-1953) of Millstreet, Co Cork. For many years Con Crowley was a director of the Roscrea Meat Company with his brother Jeremiah D. Crowley of Wallstown Castle, Castltownroche, Co Cork – the other directors included Robert Briscoe TD and G Fasenfeld. After World War II, Con Crowley bought Finnstown House, an 18th century manor house outside Lucan, Co Dublin, that is said to incorporate parts of the older Finnstown Castle. Records dating from 1547 refer to the area as “Fyne’s Town,” while 17th century maps spell the name “Fyan’s Town.” At one time, the three principle country houses or estates in the parish of Esker, outside Lucan, were Hermitage, Woodville and Finnstown. Hermitage is now a golf club and Woodville has been demolished, so Finnstown House is the only one of the three that is now open to the public. Joseph Browne was living at Finnstown in 1622. By the 1640s, Finnstown was owned by Lamerick Nottingham, a brother-in-law of Patrick Sarsfield, Earl of Lucan and hero of the Siege of Limerick. In 1650, Finnstown Castle belonged to Alderman Walter Kennedy. When he died in 1672, Finnstown passed to his eldest son, Christopher Kennedy. However, the Kennedys’ Jacobite loyalties were their undoing, and Christopher Kennedy’s son, Colonel Thomas Kennedy, fled to Spain. By 1837, Finnstown House was owned by John Rorke, a Dublin solicitor with offices in Upper Temple Street. In the 1860s, Thomas James Nash (1825-1887) from Millstreet, Co Cork, bought Finnstown House and its surrounding estate of almost 3,000 acres. 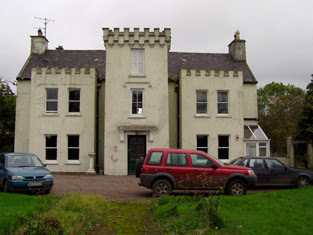 Thomas Nash’s father, James Nash, lived at Tullig House in Millstreet, Co Cork. When James Nash died on 23 August 1849, he left Thomas a wealthy landowner at the age of 24. Nash married a daughter of Richard Grainger (1797-1861), the planner who designed the city centre of Newcastle-upon-Tyne in the 1830s and 1840s. Shortly after he came into the possession of Finnstown House, Thomas Nash commissioned an architect to redesign the front rooms of Finnstown House. His eldest son, Richard Grainger Nash (1860-1914) of Finnstown House, was the pioneering force behind both the Lucan Dairies and Lucan Mineral Waters, founded by the Nash family in the late 19th century. The mineral water business peaked in the Edwardian era, with Nash’s ginger beer being marketed and sold in popular stone jars. The Lucan Dairies were bought in the 1960s by the American company WR Grace, and later became part of Unilever. In 1917, Richard Nash’s widow, Caroline, married the Revd Canon Charles Follis, Rector of Carbery in the Diocese of Kildare. In 1918, she sold Finnstown House. She died in 1967 aged 88. Con Crowley sold Finnstown House and the immediate grounds and fields to Christopher Keogh and his family in the 1960s. However, the Crowley family continues to farm some of the land today at neighbouring Coolmore. The Keoghs hosted several hunt balls for the South County Dublin Hunt at Finnstown House. Then in 1986, the Keogh family sold Finnstown to Eoin and Nora Hickey, who opened Finnstown Country House Hotel on Saint Patrick’s Day 1987. Today, the hotel stands in 45 acres of manicured lawns and gardens and is now part of the Mansfield Group. I don’t know if Con Crowley ever knew that Thomas Nash, an earlier owner of Finnstown House, was also from Millstreet. But he never forgot his roots in north Co Cork. He erected two stained glass windows in Saint Patrick’s Church, Millstreet, in memory of his parents Denis and Margaret Crowley – my great-grandparents – who are buried in the grounds of Drishane Castle, on the edge of Millstreet. On Sunday, I was the proud great-uncle at Finnstown House. Little did I realise when I fell in the nettles 35 or 40 years ago that I would enjoy returning to Finnstown House for such a happy family celebration. It's interesting to read your blog. I saw an excerpt frpm the Millstreet Website a few days ago and then doing a search for Drishane castle came across it again. My sister Martina lives in what was your Family's Crowley homestead. I read with interest about the Church Windows in our local church - I think that in the Cahpel in Drishane they also installed a window - I must check it and let you know. Sister Cornelius Crowley was a member of the order and also her sister - I dont remember what her name was. There is also a marble fitting ont he chapel which was given by the Crowley Family to the Order to put in the Chapel. That was in the early 1930's when the sisters built the chapel. ia m the current owner and recently we restored the Chapel it being the worse for wear of the past 20 years. I will check the windows and let you know . Thanks for your comment Suzanne. I'm not sure about your ancestors. My grandmother's family was from Millstreet, Co Cork, but you gave no indication of where your ancestors came from. Crowley is a very numerous name in Cork, so without more specific details I may not be able to help. But I hope your search produces results and is a happy one. I happened upon this blog post whilst searching for some information on Coolemore house in Millstreet. My Granmother was Con's sister Margaret (Peggy) Crowley. Three other sisters became nuns and lived in Drishane when it was a convent. One of his sisters Sr.Ann Crowley and a brother Bill crowley are still living. My mother and I have visited the windows you speak of in Milstreet. So it would appear we have great grandparents in common! Thank you for this information Joan, it helps to fill out more of the family story. Unfortunately I don't have any contact details for you. Could you get in touch with me as I would really like to find out more details about this side of the family? You can find me through my Facebook page or calling me at work. I sent an email to TCD on Friday. (to another Patrick Comerford initially!) There is some more information in that You will be able to contact me by reply. Bill Crowley of Coolemore passed away in the last few days. It is indeed. My great uncle. May he rest in peace. Crowley (Nee Shaw) (Lucan and formerly of Millstreet and Dungarvan) August 15th 2016 (peacefully) in the loving care of the staff at The Hermitage Hospital, Ethna (Colleen) beloved wife of the late Ted and dear mother of Henry, Mary, Teddy, Pam and the late Con and Joan. Sadly missed by her loving family, son-in-law Gerry, daughters-in-law Gina, Mary and Julie, grandchildren, great-grandchildren, sister-in-law, nephews, nieces, relatives and friends. Hi , Have read your history on Finnstown and the Crowley Family , very interesting . I think the man's name was Denis Crowley ?